If there's an ill fated film, it's this one. Not only because of the subject filmed by Hollywood standards (the cast nearly entirely white) but also because of the location they used which was radioactive and basically doomed the entire crew. Many, including Wayne and Hayward, would die from cancer several years, decades later. 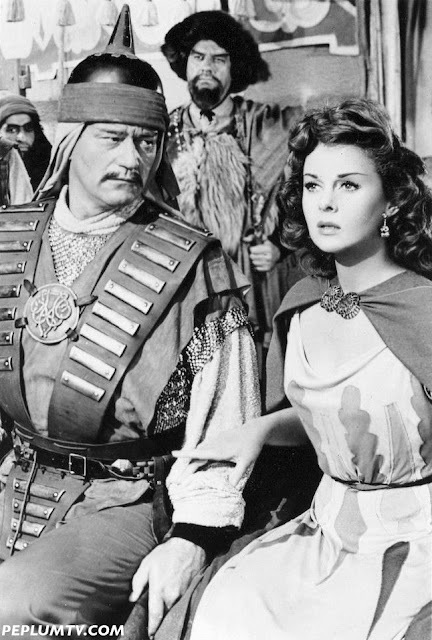 Though Wayne made few PEPLUM genre productions, Hayward was a pro, having appeared in may films, including DAVID & BATHSHEBA and DEMETRIUS & THE GLADIATORS, to name a few. A groaner for sure and yet still entertaining. THE CONQUEROR is so ridiculous as to be beyond parody. Nevertheless, it is a fun flick to see once. I love those dancing girls too. Wayne and Susan must have realised this was a major turkey, but maybe did it a a favour to Howard Hughes. Its still vastly enteraining now though.